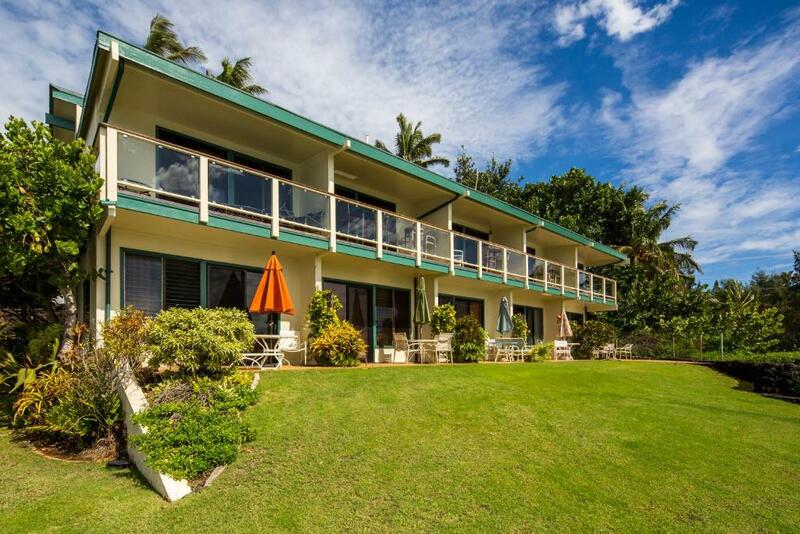 Excellent location with view of the ocean and proximity to the beach. 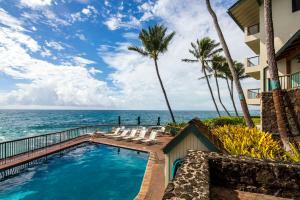 Great location and beautiful ocean view as well as a lovely pool. We rented 3 condo's for our wedding, and the office was able to place us all next to each other which made for a seamless ceremony and vacation experience. The rooms are spacious, well stocked for any need, and the view cannot get better off the balcony. Falling asleep to the waves was like being rocked to sleep. The pool and the view off the pool deck are amazing, we saw so many turtles, and had the luxury of watching pods of dolphins swim past on more than one occasion. The staff is welcoming, friendly, and really took care of us. 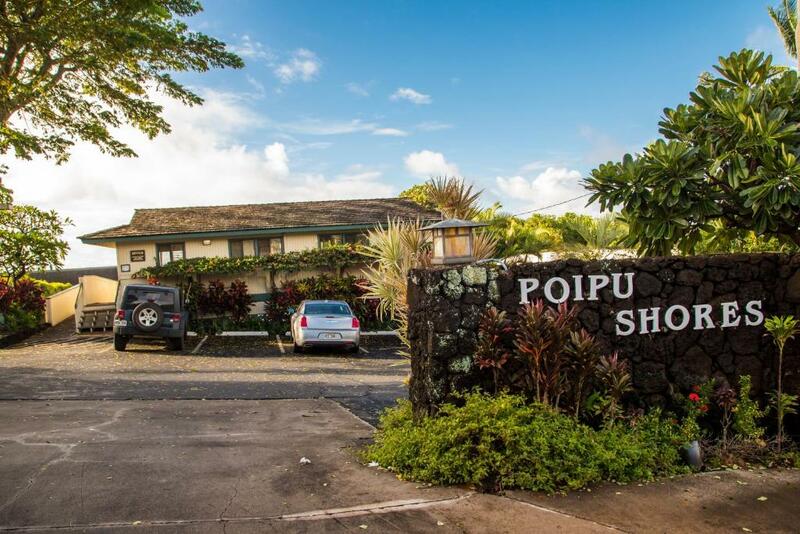 The location is perfect for Poipu, a little walk downhill gets you to the beach, or just park by Brennecke's Restaurant, which also has a deli/shop if you need any beach needs. There was a turtle and seal on the beach sunning along with everyone else. Bring rubber shoes, as the lava rock can be sharp down there. This is one of the best places I have stayed in Hawaii, and easily the best views. The master bedroom was very comfortable with an astounding view. With the proximity to the ocean came very loud wave crashing, which might be hard for some to sleep through. You can’t really close the window because you need the ocean breeze to stay cool. But worth it to enjoy this view. The master bed was large and comfortable. The kitchen was well stocked with everything you need for a week or two (except food). A very nice large shower in the master bedroom. Also great to have laundry in the unit so that you could wash and dry sandy towels (suggest bringing a few laundry pods since none are provided). Awesome location and views on the cliffs next to Poipu Beach with waves crashing below. Whale and sea turtle watching off the balcony. Sunset views. Short walk down to the beach. Short drive to everything else. Good relaxed family-friendly condos with good kitchen, baths, laundry. Good BBQ facilities - lots of folks were cooking and eating in. Not glitzy at all - real people staying there. If you are looking for a resort experience, stay at one of the many resort hotels nearby. Access to excellent beaches. Waves crashing on the rocks just feet from the unit. Sightings of whales and turtles within eye range. Panoramic view from picture windows. Uncrowded. On ocean, very near our favorite beaches. Had asked for 3 units right next to each other and that is what we got. We stayed in 203A and really enjoyed our stay. We loved being right on the ocean with a full ocean view. Loved having 2 bathrooms, a full kitchen (coffee pot, toaster, microwave, ice maker, plenty of dishes, cups, silverware, pots/pans, etc...even Tupperware!) Loved the easy access to the swimming beach. We had no issues with parking. There are 3 levels of parking, and we usually got parking on the 2nd level. We would definitely stay here again and again. It was so nice waking up and seeing the ocean view. The pool was very nice and would only be better if it had a hot tub nearby as well. 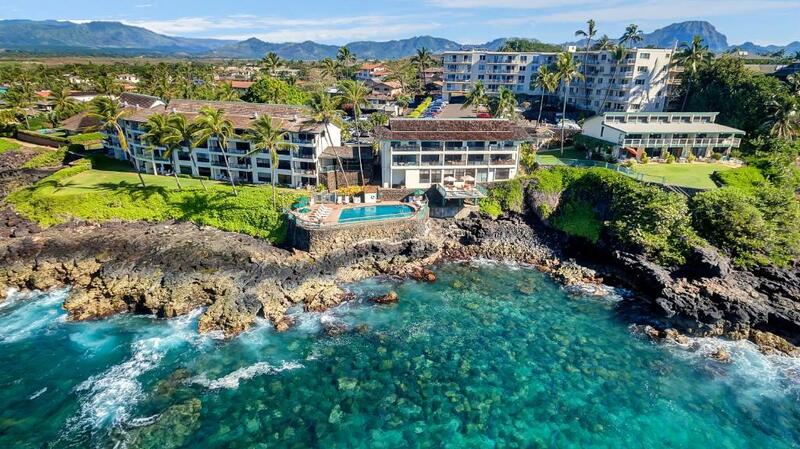 Castle Poipu Shores This rating is a reflection of how the property compares to the industry standard when it comes to price, facilities and services available. It's based on a self-evaluation by the property. Use this rating to help choose your stay! One of our best sellers in Koloa! 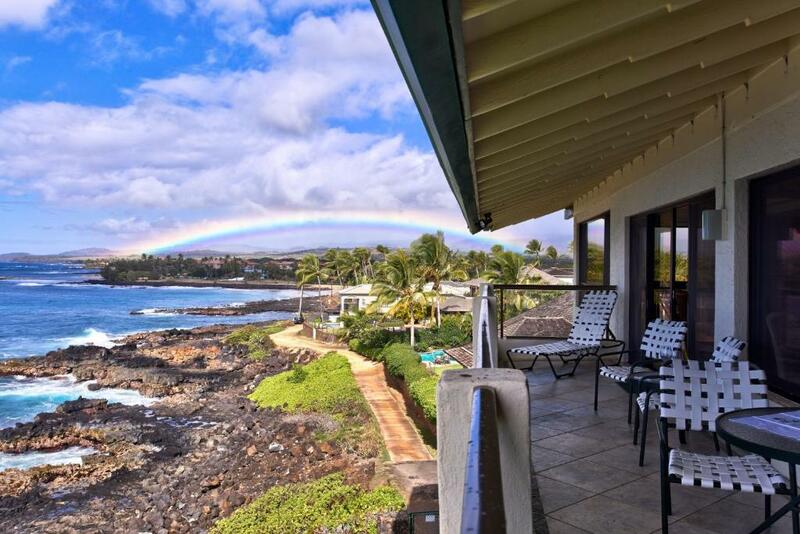 On Kauai’s south shore, this oceanfront property is a 5 minute walk from the gold sand of Poipu Beach. Free Wi-Fi and large private patios with ocean views are included in all apartments. A full kitchen is featured in all non-smoking modern apartments at Castle Poipu Shores. A washing machine and dryer, cable TV, and ceiling fans are also included. A heated outdoor pool is available for guest use. BBQ facilities and furnished terrace are on site at Castle Shores Poipu. 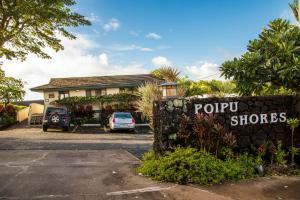 Poipu Shopping Village is a 20 minute walk away. Downtown Koloa is a 10 minute drive away. Lihue Airport is 14 miles from Castle Poipu Shores. 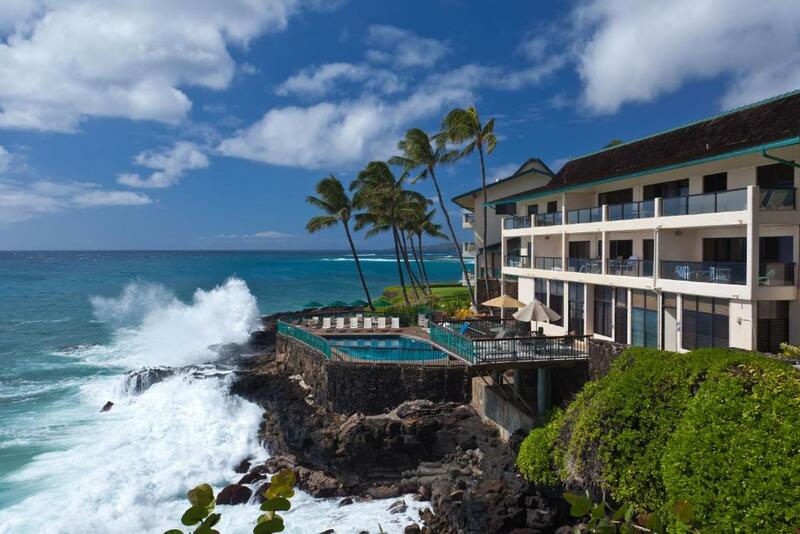 When would you like to stay at Castle Poipu Shores? Has an ocean view from a spacious private terrace. A hidden jewel featuring all oceanfront views. 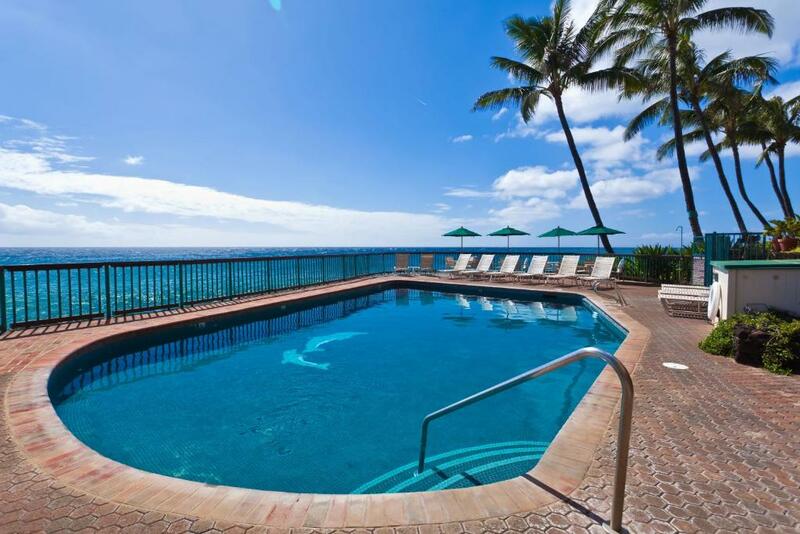 This condo resort in Poipu features an oceanside pool and barbeque area. Walking distance to Keoniloa Bay, Shipwreck, Brennecke and Poipu beaches. Beyond your seaside retreat, Kauai begs to be explored, from its scenic and sacred sites to its jungles and beaches. Some of them are one in the same. Luckily, you are in a prime spot to experience it all. Take a scenic drive to the even more scenic Waimea Canyon, the "Grand Canyon of The Pacific." Picnic near the river at Wailua River State Park or under a monkeypod tree at The Keahua Forestry Arboretum. Poipu's nearly three miles of coastline is adorned with half-moon shaped sandy Kauai beaches, many with incredible views of the mountain ridge between Wailua and Kapaa, otherwise known as "Sleeping Giant." Swim and snorkel the calm waters of Hanalei Bay, at the base of sheer cliffs and rocky mountains. For more adventurous Kauai activities, take a helicopter tour up Hanalei Valley (yes, where Puff the Magic Dragon lives), past the wettest spot on earth to Kauai's highest waterfall, and on to the Napali Coast. Or brave one of Kauai's three navigable rivers by kayak. For a more mellow expedition, stroll the streets of Old Kapaa Town, a quaint little 19th-century plantation town lined with Kauai restaurants and shops. House Rules Castle Poipu Shores takes special requests – add in the next step! Castle Poipu Shores accepts these cards and reserves the right to temporarily hold an amount prior to arrival. A taxable cleaning fee will be charged per unit, per stay. Cleaning fee varies by length of stay and unit size. Castle Poipu Shores features a grocery shopping service through Castle Island where groceries are delivered to guest rooms upon request. Purchases over 50 USD will receive a 10 USD discount. Please inform Castle Poipu Shores of your expected arrival time in advance. You can use the Special Requests box when booking, or contact the property directly using the contact details in your confirmation. For the luxury price the place is a bit outdated and run down. It was very noisy with open windows allowing us to hear the loud families and late night parties. Condo was a little dated but still very comfortable! Great location on the water. Pool right on ocean was great. We specifically called and asked about an air conditioned room and were told NONE had air conditioning except one penthouse. Evidently not true according to other guests that had it. We felt like we were in a wet sauna and had no sleep for the entire stay in unit 301A. While the sound of the ocean is wonderful, it was loud and booming at night and with no option but leaving all windows open, it was not pleasing. Could not sleep in the spare room as it is against the stairwell with a light on all night as well as a glaring red exit sign that we could not block out!! I would suggest the owner of this unit invest in air conditioning. Other that that, it would have been much more pleasant. Also, the lighting tracks above the beds had over a 1/4 inch of pure dirt build up. Cleaning staff never touches it. You only see it when you're in bed, but still, we paid a large cleaning fee and this should be attended to. Very very noisy from ocean noise, couldn't sleep at all. No air con so very very hot. Staff not welcoming, just do bare minimum. Very expensive for what it is. I would suggest you stay elsewhere. Nice view but not worth it for the noise. Elevator was broken for the last4 days of our visit. They said it would’ve fixed but didn’t happen before we left. Bring seasonings and salt and pepper, those are not included. Where the master bedroom had a marvelous view and a comfortable bed, the second bedroom had a window on the hallway (loud with lots of people walking or running by in Flipflops) and mattresses that were hard as box springs (no joke). The beds were so hard that they were only slightly better than sleeping on the floor. The second bedroom is ok for small children who don’t care about comfort, but my teenage girls were very uncomfortable. They were also woken up every morning by kids running past the room, since the window opened on the hall. I would not recommend this place if you want to use the second bedroom although the master bedroom is terrific. Kitchen was not well equipped. Pots, pans, bowls and tableware were cheap, old and scratched; knives were rusted. Beds in second bedroom were uncomfortable and the headboards were not connected to the beds which made noise each time you moved. Outdoor furniture old, glass table cracked. Roosters crowed outside the bedroom window at 5am. Rust and corrosion on all metal surfaces; railings need paint. 2nd bedrooms were a little small. The apartment was not clean, the beds (mattresses) were old and uncomfortable. The pull out beds were a disgrace! Surely they are from the 1940's!! Disgusting!!! The views and location were sensational! The unit has wicker carpet which is really uncomfortable to walk on without shoes. I'm sure it has its benefits, but I'd update it to either tile, or some other indoor/outdoor carpeting that is more pleasant to a bare foot. The unit had pretty much everything we needed, except for salt/pepper/cooking spray/laundry detergent. These are items that are too big to buy for just a few days stay, but would have been great to have on hand in the unit. The unit did have soap for the dishwasher, which was very much appreciated. The whole property is a bit tired. Its visible that the property gets a battering by its proximity to the sea. Our "deluxe" apartment room (105A) was tired, outdated and not clean. Parts of the apartment had been updated but other parts in desperate need of an update (and thorough clean). We asked reception if there was another room available but she explained that as alot of the owners were occupying their properties at that time there was nothing else available. Curtains not clean at all and need to be stripped along with some of the outdated furniture. Basic things like having a valance on the bed would make it alot nicer. We kept the screen doors closed at all times but still had a problem with insects in one of the rooms. There were alot of sand flies flying around in one particular room and they would die and land on the linen of the bed. Not nice to go to bed and find dead sand flies all over the white sheets. We didn't end up sleeping in that room that night but we didn't complain as it was our last night there anyway. Full kitchen but no basics like salt or pepper provided. We booked the apartment for this complex through Castle Resorts rather than directly with an owner/manager as we wanted a room that was going to be serviced etc. Room was not serviced at all - towels replaced only once. We didn't see any benefit out of booking through Castle Resorts rather than directly with owner/manager. 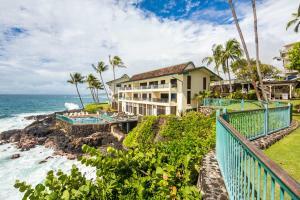 Great location, easy walk to Poipu Beach which is a nice beach for swimming and snorkelling. We enjoyed the pool very much and loved watching the turtles from the pool deck. We were also lucky enough the enjoy dolphins from the lanai one morning. Nice updated kitchen and master ensuite (room 105A).